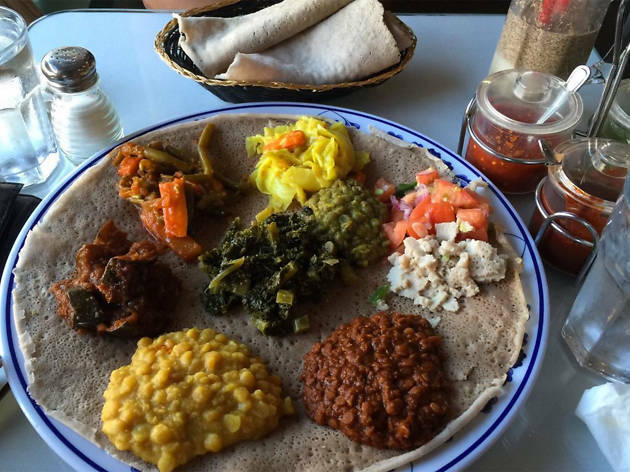 Rahel's is Little Ethiopia's sole vegan restaurant. 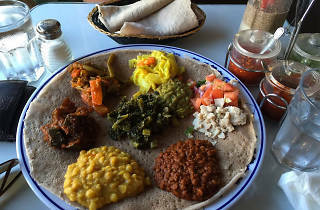 Owner Rahel Woldmedhin was the original founder of nearby Messob before opening her vegan eatery, which eschews imitation meat and instead focuses on vegetable-rich stews accompanied by injera. In addition to Yemisir Kik Wot (split lentil stew), Yeshiro Alicha (mild chick pea stew) and Yedinch Wot (potatoes stew), there's a nice selection of combination dishes that bring diners' favorites sides together. The best way to end the meal is with Rahel's vegan cheese cake—and perhaps a special Ethiopian juice, like telba (made from flax seed) or besso (made from barley).